Does your baby leave everyone behind in a cloud of blue smoke?
. 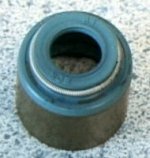 . . try this very inexpensive fix to seal your valves. 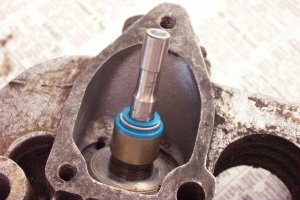 Valve seals are used on practically all new cars today. 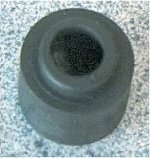 They are used on inlet AND exhaust valves. An inexpensive modification for your Triple . . . that works! 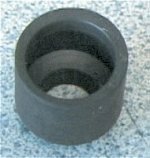 1 There are various types of seals available. On the far left are two seals sold by your local British bike dealer. They don't even fit properly. Doh! 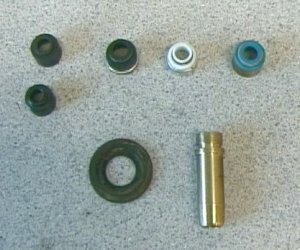 The large 'washer' (lower left) is the plate that acts as a seat for the valve springs. Also shown is a stock guide (lower right). 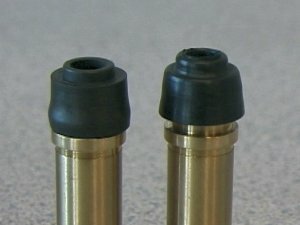 2 Here's a stock valve guide. Wow. 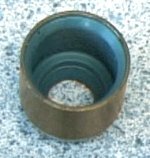 3 Before valve seals were widely available an alternative option was to cut a 'knife edge' on the top of the valve guide. 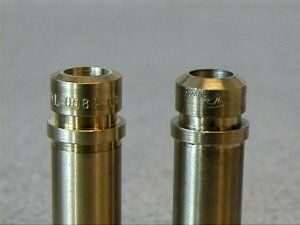 The standard guide (left) shows a flatter top, the modified guide (right) has had it's top lip cut to a knife edge to help drain the oil away from the valve stem. Not as effective as a good fitting oil seal - not to mention more work (and expense). 4 Here's a type of seal you may find at your local British bike dealer. Check very carefully - ask to see the seal on a guide before buying . . .
5 . . . because here's the same seal on a guide (on the left) . . . and just look at the great fit of the seal on the right! Don't bother with either of these seals. Amazingly, both of these seals came in the same set - sold by a dealer specifically for use on the Rocket3/Trident. 6 Here's a good seal that works well. You can get them for about $2.20 US (as of NOV-2006) from Raber's in San Jose, California. Their part number is : 70-6420S. They will fit directly on the guide - so long as you install them correctly (ie squarely!). Use a 6" section of regular 1/2" galvanised steel pipe as a drift.